Heat 1 or 2 tablespoons of the fruity EVOO in a large non stick pan on medium high heat. When hot, add the diced oyster mushrooms & fry for about 3 to 4 minutes until golden & cooked through. At the end , I added freshly grinded black pepper & some Maldon sea salt. Taste! It has to taste fab! Drain a bit of the juices & set aside. Let it cool down a bit. In a larger bowl, add the flaked drained tuna, apple pieces & tomato pieces. Add 2 to 3 tablespoons of your mayonaise to the bowl. Combine all these ingredients. Do not add too much mayonaise. Add some freshly grinds of black pepper & a bit of Maldon sea salt flakes. Combine well. Taste! Now, add the baked oyster mushroom pieces. Carefully, fold the mushroom pieces into the rest. Heat 4 tortilla wraps following the instructions of the packet. Lay a tortilla in front of you. Lay 3 or 4 little Gem lettuce leaves in the middle of your tortilla. Spoon the mix over the top of the salad leaves, in the middle of your tortilla & then carefully wrap it up! Turn them around & carefully cut the filled tortilla's into 2 with a sharp knive. Do not add too much fiiling otherwise it can get messy when you eat the wraps! 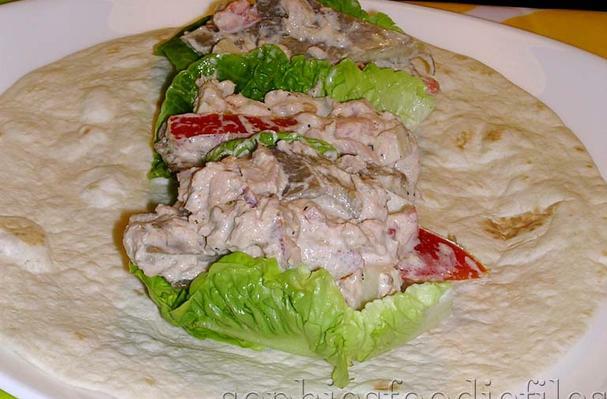 I made these wraps a few days ago because I wanted delicious, easy yet tasty wraps as lunch. I had a can of tuna , tomatoes, crunchy salad leaves, an apple & fresh oyster mushrooms. So, I made these tasty wraps!